Reece Holt with his mum Rachel, taken on Thursday January 17, the day before he passed away. The night sky has been tinged with gold this week to mark the passing of “brave warrior” Reece Holt. Thirteen-year-old Reece died in hospital on Friday morning, January 18, with his family gathered around him. The Ashton Memorial lit up in gold for #teamreece. Photo by Ian Greene. He had been battling Anaplastic Astrocytoma, a rare malignant brain tumour affecting just 10 children a year, since May 2016. The teenager’s mum Rachel O’Neil said she now wants to continue her son’s legacy by carrying on the charity work he started when he set up his own charity, Team Reece, to help other children with cancer. “I don’t want any other mother to have to lie with their child in their arms and watch them take their last breath,” she said. Lancaster Royal Grammar School pupil Reece announced his brain cancer was terminal on his charity’s Facebook page in February last year. After enjoying a family Christmas, however, Reece’s health took a sudden downward turn last week, and he was being cared for in the Royal Lancaster Infirmary. A message posted on Facebook on Friday said: “Our bravest warrior Reece left us at 11.30am this morning while being cuddled by mum and surrounded by his family. The Ashton Memorial has been lit up in gold since Saturday evening in Reece’s memory, and his family – including Rachel, Reece’s dad Chris, step-dad Lewis and brother Callum, who will be 12 next week – all visited the park to see the spectacle. Rachel said: “I was in tears but they weren’t sad tears, I was just so moved. It was really lovely and I am a very proud mum. “Reece was really humble, he never did anything for the attention, he just loved doing it. That’s why he spent so much time doing events for Team Reece rather than going off to places for himself. 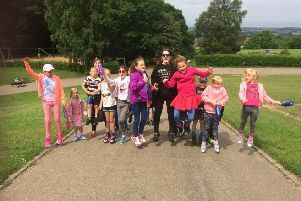 Reece set up Team Reece in a bid to help other children with cancer and their families, as well as helping to provide funding for vital research for brain cancer in children. He went on to raise more than £100,000 – and Rachel said the charity will continue in his memory. “We have just taken over our new office on White Cross and it will be my drive now to continue with that,” she said. “I don’t want any other mother to have to lie with their child in their arms and watch them take their last breath. “That will be my vow – to make a difference. “Instead of allowing my grief to swallow me, it will drive me forward. “Reece won’t get to see the office up and running, but he will be there with us. “We have got a lot of events we want to launch this year which we hope everyone will support, because without that support we don’t get off the starting block. Reece grew up in Overton and went to Overton St Helen’s Primary School, where he was a 10-year-old in Year 5 when he was first diagnosed. Head Joanne Easthope said: “We are just devastated by the news. Reece was such a wonderful young person, he was an ideal pupil - he was very polite, well-mannered and intelligent, just a beautiful child from start to finish. “It was remarkable how he shared his whole journey with us. He became poorly in Year 5 and was brave enough not to let it beat him. “He taught the children about what had happened to him, he was never afraid of it and didn’t let anything faze him, and because of that everyone loved him for it. Reece passed his 11+ to take up a place at Lancaster Royal Grammar School. The school will be having a book of memories for pupils and staff, and support is available for pupils where needed. A spokesman said: “It is with much sorrow that we are marking the death of our pupil Reece Holt at the age of 13. “Reece had a big impact on Lancaster Royal Grammar School. He was the most positive of pupils, and the bravest. Reece loved coming to school, and his classmates were delighted to spend time with him in lessons. “It was a major highlight that Reece was able to take part in the Pooley Bridge outdoor residential in glorious weather last summer. “Most recently, it was lovely to see him take part in the carol service at Lancaster Priory and attend the school’s end of term pantomimes. “Reece already knew that he had a serious brain tumour when he started at LRGS in September 2017, and his time here was punctuated by illness and hospital visits. “He inspired the school to make Team Reece a focus for our charity fundraising, and we will continue to honour his memory. Mrs Hodkinson, Reece’s Year 7 form tutor, said: “Reece was a valued and popular member of 7S. His enthusiasm to learn, even when he felt unwell, was an inspiration to his class mates and will be remembered fondly by his teachers. “At the Pooley Bridge residential he showed such determination to enjoy the activities, reaching the top of the wall in climbing, jumping from the top of the cliff while coasteering and helping to plan a race winning raft on Ullswater. Reece was crowned Young Achiever at the Visitor Sunshine Awards in 2017 as an acknowledgement of all the work he had done for charity. Reece’s funeral service is to be held at Lancaster & Morecambe Crematorium at 2.30pm on Friday February 1. Anyone who wishes to attend is welcome to do so, and people are asked to respect the small venue and ensure family and close friends are seated first. If necessary, a screen will be erected outside. Those attending are asked to wear something gold – if only a ribbon – to signify childhood cancer, or if they prefer not to wear black, they can wear something in the green and purple colours of Team Reece. A crowdfunding page set up by family friend Rachel Holme to help towards funeral costs had raised more than £11,500 as the Visitor went to press. Rachel said: “I don’t need to spell out how awful it is to have to watch your child die and for Rachel, Chris and his whole family to then have the pressure of looking around at what you can sell to pay for his funeral costs. Reece’s mum Rachel said: “I never expected such an outpouring of love and support to help send our boy off; I’m completely moved by the amount donated so far and from the very bottom of my broken heart you are in my humble opinion the most amazing community ever and I’m so proud to be a part of it. “The last thing in the world anyone wants to do, even when you know it’s coming, is saving up for your kid’s funeral; you just can’t do it. “I said I would sell my Golf as a back-up to pay for the funeral. I have always been a bit hesitant to fundraise for our own costs because I am a bit proud, and I just wanted to fundraise for others. “I just can’t believe how much has been raised. I am very moved by our community. Everyone has come together and that’s something else really. “I had a chat with Callum about the money and he said that Reece never got his wish to go to NASA, and suggested that we go and take his ashes so he is with us on his wish trip. I thought that was a lovely idea. “Reece never really knew how many people he had touched as he was so very humble in his pursuits; he did it to help others and was never bothered about recognition, he just loved the events and seeing the smiles on children’s faces. As well as the local community, Rachel also expressed her gratitude to the staff at the Royal Lancaster Infirmary. “The hospital was absolutely outstanding,” she said. “The staff there are not in it for a career, it’s a vocation and that makes a difference. Reece with Morecambe FC manager Jim Bentley at the Visitor Sunshine Awards in 2017.